With over 40 years of experience treating patients, we know that our male patients have specific needs and are statistically less likely to see a doctor than their female counterparts. One of the reasons for this reluctance to see a physician is the inconvenience of taking a half day off work just to have a visit with a doctor that lasts only a few minutes. Luckily, we have been able to optimize the efficiency of this experience using our technology platform. Now, there is no need to take any time off work, and in some cases you can have the visit on your phone or computer while you are at work. However, there are still other challenges to address that are specific to the needs of our male patients. With aging, many men experience a variety of specific health challenges including male pattern hair loss, testosterone deficiency, prostate enlargement, and erectile dysfunction. 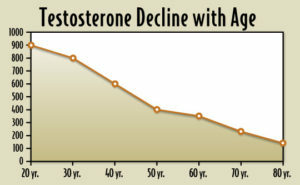 Testosterone deficiency is a well described and undertreated problem. It can affect up to 1 in 3 men over the age of 45. Despite this high prevalence, we find that our male patients are rarely questioned about this during their routine medical visits. Low testosterone levels can lead to fatigue, weight gain, and even sexual dysfunction. We can provide quick screenings and efficient testing to assess and treat for testosterone deficiencies to make sure our patients achieve their maximum vitality and fitness. Similarly, prostate enlargement is an inevitable consequence of aging in males. 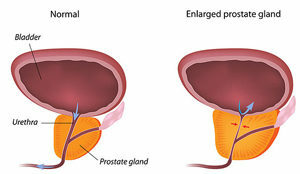 If the prostate enlarges past a certain threshold, it can cause difficulty urinating. Often therapy for this is only begun when the patient already has symptoms which can be too late sometimes. Patients often feel uncomfortable discussing this in the doctor’s office and thus it gets missed. We offer our patients the opportunity to have private discrete discussions with our physicians from the privacy of their homes. 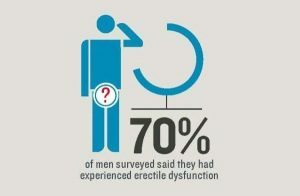 One of the most challenging health issues for men is erectile dysfunction. Despite its high prevalence (up to 40% of men over 40 and 70% of men by age 70), it is undertreated and even less often discussed. Many men have difficulty discussing this with their doctor in the typical office setting. We offer our patients the opportunity to have confidential and discrete discussions with our physicians from the privacy of their homes. We can assess, treat and even have the medication delivered to you in some cases so you can get the treatment you need while maintaining total privacy. 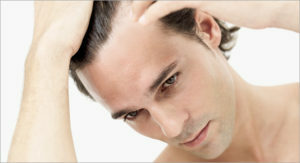 Male Pattern Hair Loss (Androgenetic Alopecia) in men is characterized by the slow, progressive loss of hair in a characteristic distribution. The condition is mediated by the action of androgens on androgen-sensitive hair follicles in genetically susceptible males. This is a very common issue that affects virtually every man at some point in his life. However, there has been significant advancement in medical science related to this condition recently. Now, there are multiple therapies to treat this condition from topical medication, oral medication, and even surgical options. Using a quick, discrete video visit, our doctors can assess which option may be best for you and prescribe any medication necessary at the time of the visit.